Bill Meerholz Enterprises – Bill Meerholz Enterprises applies our extensive experience to serve your specialized needs for expertly refinished, restored, NOS and selected used musclecar-era Chrysler/Mopar parts! Customer satisfaction, as always, is guaranteed! 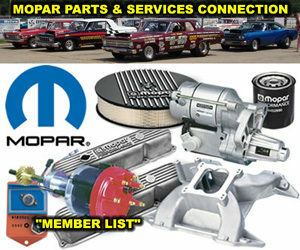 Bill Rolik Enterprises – 34 categories of NOS, reproduction and replacement Mopar parts, plus BRE Signature Apparel and special website features! Also, expertly refinished original Mopar parts as well! Clark Classic Restortions – Professional, detailed classic car restorations. Classic Truck Consoles – Design and manufacture of fiberglass center consoles for muscle cars and trucks. CruiserMotorSports – We offer a one stop PT Cruiser aftermarket accessories and Care Car Products that supersede all others.